Hey everyone, this is our newest family member...Nina. 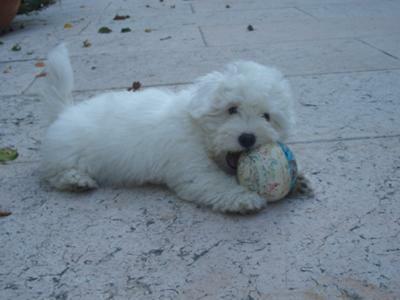 Pure white coton female...simply adorable. Coton de Tulear Identity Problem? Your coton puppy looks exactly like my dog Linus. I think the coton de tulear is so distinct, but every time someone would come up and meet him they'd ask if he was a poodle or a Bichon or a maltese or even a golden retriever. I guess it's par for the course with a rare breed. Enjoy the sweet puppy days! What a cutie! I also have a Nina who is just over a year old. I hope you enjoy yours as much as I enjoy mine. That looks like a softball with string after the top came off. Wonderful puppy memories. Many many wonderful yrs. Luv her to death. YOU ARE SOOOOO CUTE, LOOKS LIKE A LITTLE STUFFED TOY. HOPE YOU AND YOUR FAMILY HAVE LOTS OF HAPPY YEARS TOGETHER. When I see photos like this I always wonder why more people don't have Cotons - they are just so darn cute!! Congratulations on the new addition to your family. Simply adorable... I have one myself... male, 2 and half yo, named Pupi... love him almost more than human being... Nina is really beautiful!! !